This pressure cast non stick aluminum 3-piece cookware set is an excellent starter set. It contains an 8-inch fry pan and a 1. 2-quart sauce pan with a vented glass lid. This is perfect for the college student, or someone with a small apartment that only needs a couple of standard-pieces. 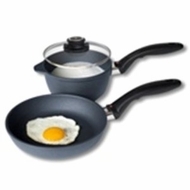 Both of the pans are of the highest quality pressure cast aluminum with a state of the art non stick surface.